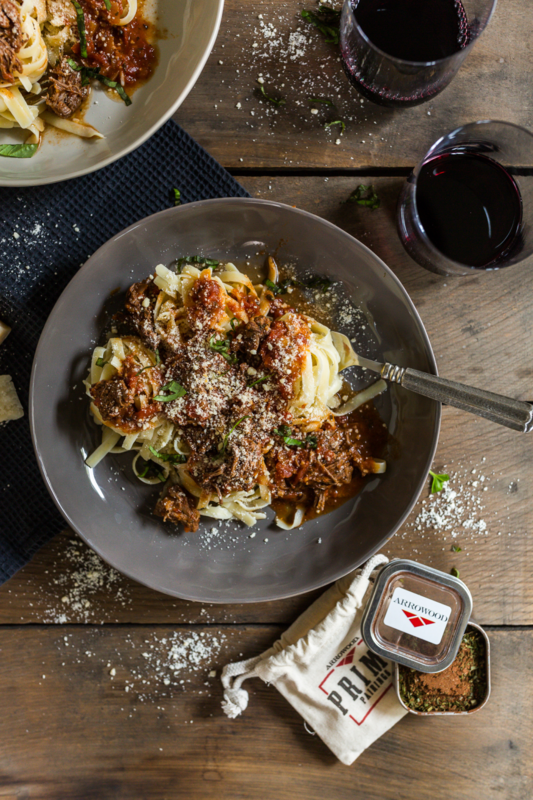 Enjoy the savory flavors of red wine braised short rib ragu served over a bowl of tagliatelle pasta. If there is one category of food that I can never get enough of, it’s pasta. Not just any pasta though. After having been to Italy I find it utterly important to buy the highest quality pasta if you want your dish to really hold its own. 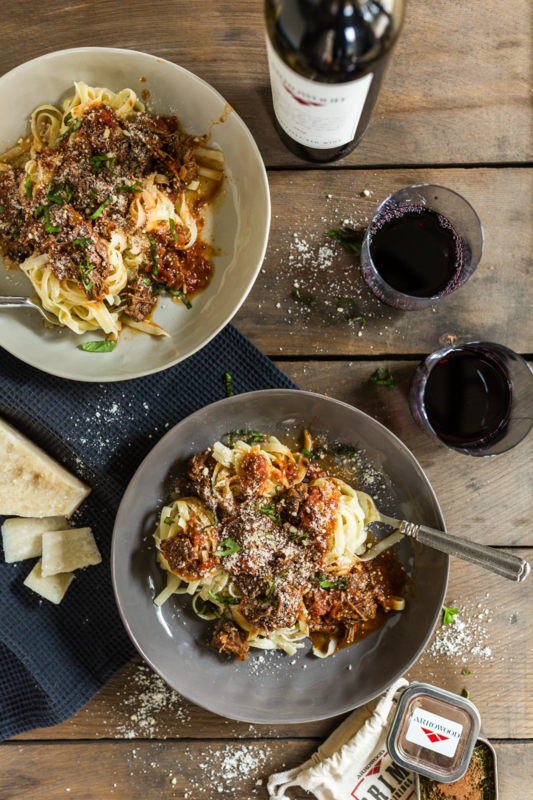 The thing with this recipe is the tagliatelle pasta doesn’t have to play the lead as the red wine braised short rib ragu is definitely going to be the star of the show. Now, I’m the first to tell you that cooking meats is typically not my strongest skill in the kitchen, but ever since getting an Instant Pot, it’s like I’m a culinary genius. I love meals that look like a million bucks, but are actually quite simple to make and that’s what this recipe is all about. No Instant Pot? No problem! You can also modify to use a standard pressure cooker. Everything that needs to happen in this recipe takes place inside the Instant Pot. Everything. From braising the short ribs to sautéing the onions and garlic and cooking it all down with a rich tomato sauce, it’s all done inside one pot and takes less than an hour to make. You can certainly make this recipe in a dutch oven or slow cooker, just plan on 7-8 hours. 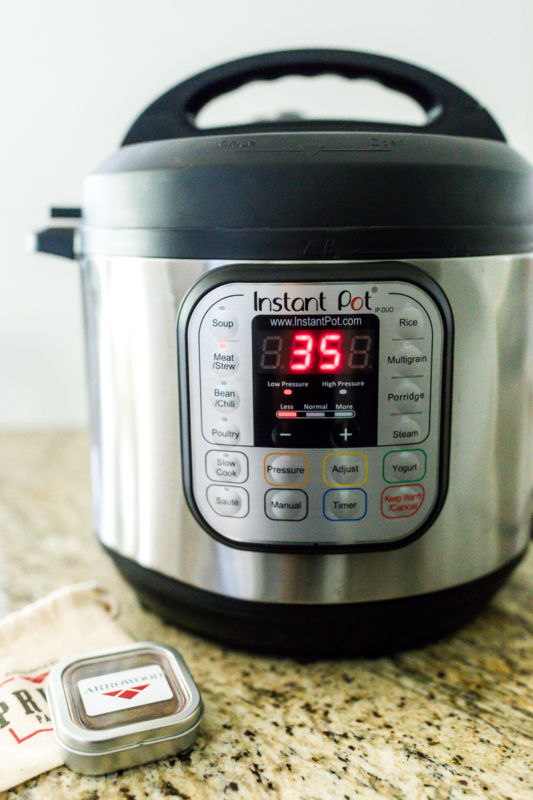 If you’re like me and are known to host impromptu social gatherings, the Instant Pot is a great way to make an insanely delicious meal that looks like it took hours of work in less than 60 minutes. That leaves me more time to enjoy the wine and food with friends and family! Using an instant pot, turn it to the sauté setting. While heating up, trim off excess fat and pat dry. Generously season with Sonoma Spice Blend. Once up to temperature, add the vegetable oil to the instant pot. Add the short ribs and sear on all sides until browned. Remove from pot and set aside. Add the chopped onion and garlic and continue to sauté until tender while scraping up the browned bits (this has tons of flavor!). Pour in the red wine and cook for approximately 2 minutes to deglaze the onion and garlic. Add the short ribs back to the instant pot followed by the tomato sauce. salt and optional chipotle crushed pepper. Add in 1/4 cup water OR add the water to the sauce jar, shake, and then pour into the instant pot (nothing goes to waste!). Set instant pot to the stew/meat setting for 35 minutes and once finished, let it naturally release the stem. While ragu is stewing, prepare the Tagliatelle pasta per the directions provided on the package. Cook to just al dente (firm to the bite, but not soft) as the pasta will continue to cook once removed from the heat. Drain and set aside. 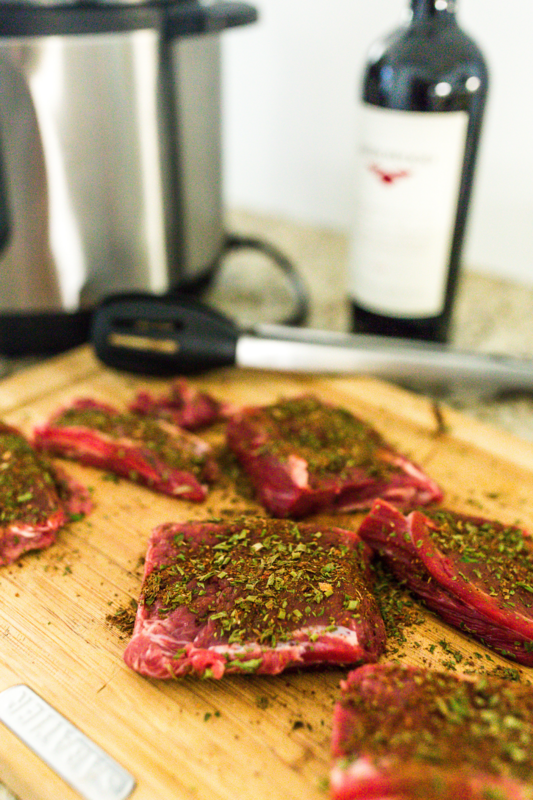 Once steam is all released, remove the lid and place short ribs on a cutting board. Trim off excess fat and remove any bones. Also, skim off any fat from the top of the instant pot then sauté again to thicken up the sauce. Once you’ve shredded the short rib, add back to the instant pot. Taste and sprinkle with salt & pepper if needed. To serve, plate first with the pasta followed by spoonfuls of braised short rib ragu and garnished with fresh parmesan and basil. 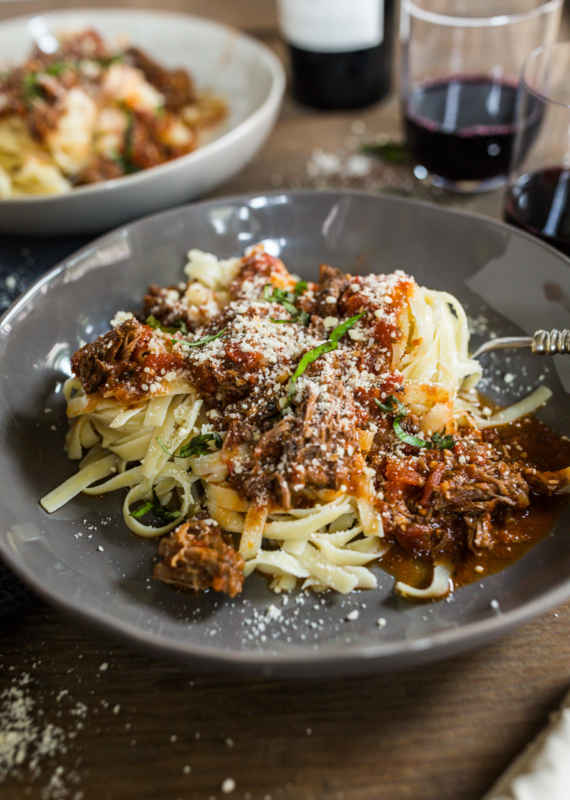 There is so much to love about this red wine braised short rib ragu spooned over a heaping bowl of tagliatelle pasta. 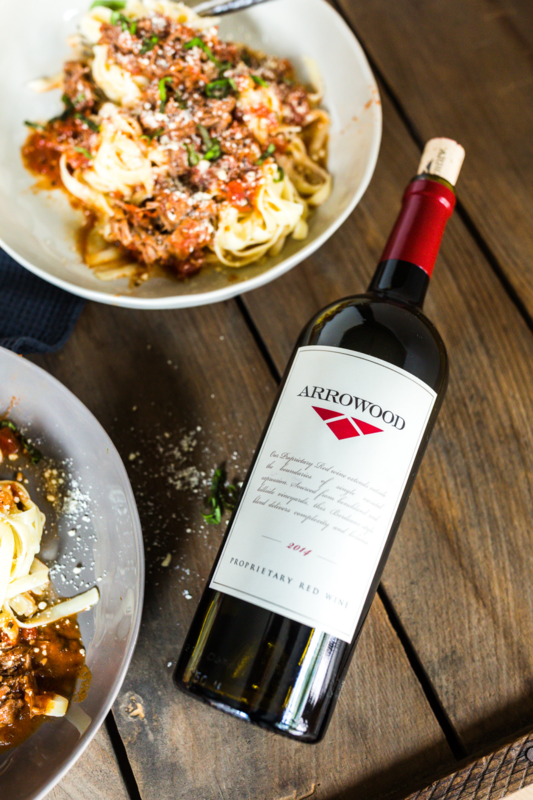 The rich tomato sauce pairs beautifully alongside the shredded short ribs and the authentic Italian pasta holds up the savoriness of the recipe while also being the perfect compliment to Arrowood Vineyards Proprietary Red Blend. The short ribs are seasoned with their custom Sonoma Spice Blend which contains dried black trumpet mushrooms, pink peppercorns, Espelette pepper, cocoa powder & additional herbs and spices. There is no hiding the fact that it gave the braised short ribs such wonderful flavor and paired perfectly with the savory aromas of the Proprietary Red Blend. It was forkful after forkful of serious goodness! Don’t shy away the next time you see short ribs at the butcher! 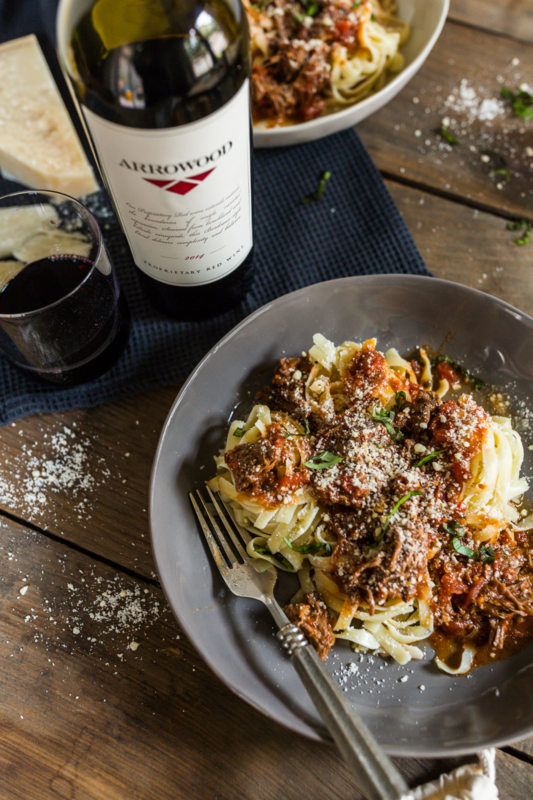 With a little bit of chopping, an Instant Pot, some Italian pasta and a bottle of wine, you’ve got yourself a culinary masterpiece that will really wow your family and friends. Cheers!